Over the past century, rampant overfishing, severe pollution, and runaway coastal development have taken a huge toll on the world’s oceans. Now, however, two major advances in global ocean governance are quietly unfolding, offering hope that the early decades of the 21st century will mark a turning point in which humanity can begin to repair the global seas. Yet a key question remains: Will the new availability of sophisticated, satellite-based technologies, coupled with the democratisation of online data about the health of our environment, help ensure that these positive advancements live up to their potential to protect the oceans? The first encouraging policy development is the explosive movement by countries around the world to set up massive marine protected areas of unprecedented size. The biggest of these newly proposed mega-marine protected areas, the Pitcairn Islands Marine Reserve, is three-and-a-half times larger than the UK, and more than 100,000 times larger than the historical median size for an ocean protected area. The 19 mega-marine protected areas created or announced in the last six years would comprise an area larger than all the protected ocean areas created previously. Several huge marine reserves currently being considered would add an additional 775,000 square miles (1.8 million square kilometres) of ocean protection. The second key development is that the UN is now drawing up a treaty that would, for the first time, manage biodiversity across the high seas — the region outside the 200-mile exclusive economic zones of individual nations. 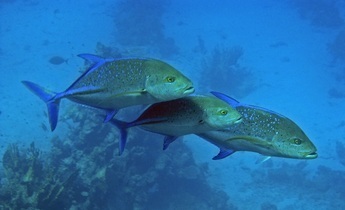 The forthcoming UN high seas treaty would be setting new rules for a swath of the ocean 22 times larger than the US. These new regulations are focused on preserving marine biodiversity, establishing international ocean reserves, evaluating processes for sharing marine genetic resources, and effectively carrying out environmental impact assessments. In the absence of systems to monitor boundaries, large marine protected areas will be nothing more than huge paper parks. These bold new policies suggest that decision-makers are finally committed to taking the kind of aggressive actions needed to stay a step ahead of industrialisation in the oceans — something we failed to do when industrialisation occurred on land. This issue extends well beyond industrial-scale fishing. Recent innovation and technological development have now made it possible to take the industries of farming, mining, power generation, and even data centre management underwater. The scope and significance of this mass acceleration of new uses of the ocean cannot be overstated. In 2014, for example, the world began eating more fish from farms than from the wild — a marine reprise of our historic shift on land from hunting wild food to farming. 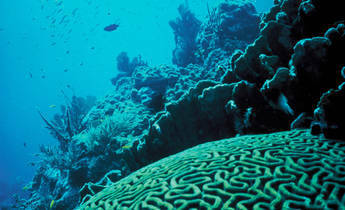 Mining claims have already been staked to roughly 400,000 square miles of deep-sea ecosystems. The campaigns to vastly expand marine protected areas and significantly improve international governance of the oceans are extremely exciting. But both of these important policy movements have an Achilles heel: Laws only matter if you can ensure that people actually follow them. These new policies cover such vast areas that they render boat, plane, and other traditional forms of ocean observation as obsolete as sextants. In the absence of systems to watch their boundaries, large marine protected areas will be nothing more than huge paper parks. Likewise, our efforts to control the exploitation of high-seas biodiversity via the new UN treaty will only be effective if we aren’t blind to what is happening in this large and distant part of the ocean. But just as technological innovation is fueling a rapid acceleration of development in the ocean, high-tech solutions may also hold the key to ensuring that a marine industrial revolution advances responsibly and intelligently. These advances, when put in the hands not just of governments but also of researchers, citizen-scientists and environmental groups, promise a new era in which we can actively observe and responsibly plan out what’s going on in the world’s seas. 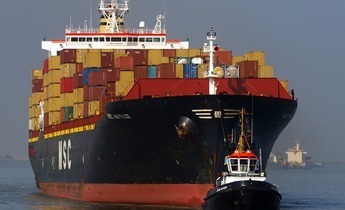 A vital solution lies in the use of satellite-interfacing sensors and data processing tools that are beginning to allow us to watch how ships use the oceans as easily as we track Uber taxis cruising around a city. Like airplanes, more and more ships now carry sensors that publicly transmit their position so they don’t crash into each other. 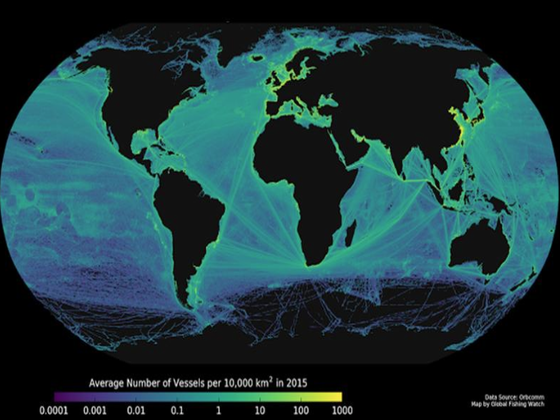 We can make use of these same streams of safety data to detect where industrial fishing is concentrated, to watch as seabed mining exploration begins, and to observe how cargo ships overlap with whale migration pathways. Instead of the oceans being a black hole of data, our new challenge is figuring out ways to intelligently and efficiently sift through the billions of data points now pouring in. Fortunately, smart new algorithms can help pick out specific kinds of vessel behaviour from this sea of big data. Ships leave unique behaviour fingerprints. For example, purse seine fishing boats make circles around fish schools when setting their nets, while long-line fishing boats travel linearly up and back along the gear they set. In a recent report in the journal Science, colleagues at the non-profit Global Fishing Watch and I monitored progress as the nation of Kiribati closed a section of its ocean the size of California to fishing. After six months of observation, we happily saw that all vessels, save one, left to fish elsewhere. Our group also mapped out the activity of purse seine (a type of net) fishing boats on the high seas of the Pacific — generating the first publicly accessible view of where fishing activity occurs in the very region that the UN high seas convention may consider setting up international protected areas. A key question ahead is whether governments will realise the value of this new data and act on calls from the scientific community to require that more vessels carry these observation sensors and use them properly. We estimate that approximately 70% of all large fishing vessels worldwide are already equipped with these publicly accessible tracking systems. Some captains, unfortunately, misuse the tool by turning it off after leaving port or failing to enter proper vessel identification information into the system. All such noncompliance issues are readily detectable by big data processing. Imaging satellites can function like space-based red light cameras that snap pictures of law-breakers at sea. If political will can be mustered to close these loopholes, these observation technologies could shed an immense amount of light on our now-dark oceans. Orbiting in space alongside these ship-tracking satellites is another rapidly growing fleet of nanosatellites that constantly take high-resolution pictures of the earth. This technology promises to be an important additional piece in the ocean-observation puzzle. The goal of the groups tending to these flocks of tiny electronic eyes is to be able to take a high-resolution snapshot of the entire earth, every day. These new imaging satellites may soon allow marine ecologists, ocean conservation groups, and marine park managers to begin to search in near real-time for ships in protected areas, to monitor weekly (even daily) losses of coastal mangrove forests, and to document abuses to coral reefs, such as dredging. With foresight, the intelligence derived from the vessel tracking systems may eventually be interlinked with these imaging satellites to enable them to function like space-based red light cameras that snap pictures of law breaking at sea as it happens. Not all next-generation ocean observation has to be based in outer space. An exciting array of new marine-monitoring technologies is increasingly available that also could be useful. Aerial drones are beginning to be used to patrol coastal waters. Fleets of drone ships may follow suit and could help monitor both the health of ocean resources, as well as the behaviour of those that harvest them. Shore- and aircraft-based radar and acoustic recorders that listen for boat noise could also be deployed. Now, anyone can keep tabs on the most remote parts of the ocean on their phones. Global Fishing Watch, for example, is releasing a product this year that will let anyone view and interact with data on fishing from across the global oceans for free. Planet Labs, a startup that manages the largest constellation of earth-observing nanosatellites, recently released a constantly updated, free library of imagery for all of California – including its estuaries, bays, kelp forests, and nearshore waters. The challenge ahead, as we enter this new era of improved ocean stewardship and attempt to govern increasingly bigger regions of the ocean, is to ensure that our new policies are actually enforced. The stakes here are high. We have to make these emerging protected areas and treaties work, and we must do it soon, if we intend to help the oceans continue to dish out large helpings of food, energy, and wonder. This article was originally published on Yale Environment 360. Douglas McCauley is a professor of marine biology at the University of California, Santa Barbara and an Alfred P. Sloan Research Fellow in the Ocean Sciences.